When OOW call for papers was on, I worked for Certus but just 3 weeks before the event we became part of Accenture. This was announced in May but as staff we didn't move until 1st October. Tim Warner and I were the only Certus people attending. This meant a new logo as we are keeping the brand. On the Sunday I went to my first Accenture meeting. This was an Alliance meeting and it was a great introduction into how they work with Oracle around the world. 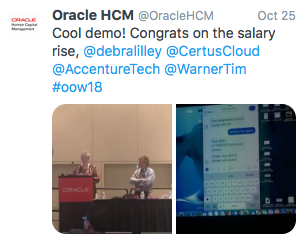 It was coincidence that OOW was in our first few weeks but the opportunity to meet the global team in person was invaluable and a major theme for me throughout the week. Monday morning there was a kick off breakfast at 0630 for the over 200 Accenture people at OOW, and Tim and I were made so welcome by everyone. However we were asked to the stage to talk about the Home Office project. We were on stage with 5 other projects and as we finished we were told we would need to dance before we could leave. I can only say it was a ‘Theresa May’ moment for me. Obviously, this was soon on social media. Accenture were so welcoming and had a number of gifts of ties and scarfs made, which I brought back to UK (after buying bigger luggage). With their permission I have cut one scarf to make another cloud cushion for the office. Tuesday, I had a bit part in the SOA Cloud session based on a Skanska HCM implementation. Skanska's Matt Gilbride talked about their innovative way to approach a global SaaS implementation. Product Manager Scott Haaland and fellow ACE director and our partner eProseed’s Simon Haslam did the technical bit. There were lots of questions as to SOA Cloud versus Integration Cloud, and as ever the answer is ‘it depends’, it depends on what you do today, and what you have already invested in. Very rarely does an organisation start with a completely blank page. Back at Certus we are working on a VBCS PoC with Oracle product Management so it was good to meet with John Ceccarelli in person, and discus next steps. I will post about this PoC soon. I did a periscope session with Accenture on the Tuesday, promoting our chatbot session. It was great fun, I love these quick videos, such a simple way to get a message across. Even better the background was made just for me. The stand was always busy, Accenture launched MyConcerto to help customers understand our offerings and there was lots of interest. Last year there were no Oracle sessions on the Thursday, just workshops, but this year sessions went on till 2pm. Tim and I had our chatbot session in this slot. The very last of the conference. However, my normal promise of English chocolate did the trick, we had a great audience. I love this session, and have given it many times since Collaborate. There is always the challenge of the WIFI, I am using HCM Cloud, APIs, Mobile and Facebook Messenger, so I need good WIFI. The advantage of being the last session was the conference WIFI was being shared amongst much fewer delegates and it all ran well. John Cafolla from HCM Development arrived half way through the session, which always has a weird effect on me. When development give me positive feedback I feel great, but I always worry they will tell me I have it all wrong. He liked it. This was a great way to finish the conference. Thankyou to everyone in Accenture for making us so welcome. In fact during OOW they announced another acquisition of Daz Systems and I spent a lot of time at the two stands in the exhibition talking to Daz employees about the process and our experience.